› Rover inspected a site where a valley was cut into bedrock, then refilled. › A site of that type had not been seen previously on Mars. Researchers slightly detoured NASA's Curiosity Mars rover from the mission's planned path in recent days for a closer look at a hillside site where an ancient valley had been carved out and refilled. The rover made observations and measurements there to address questions about how the channel formed and filled. 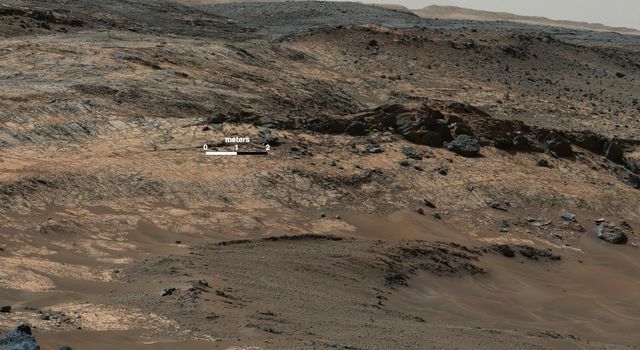 Then it resumed driving up Mount Sharp, where the mission is studying the rock layers. The layers reveal chapters in how environmental conditions and the potential to support microbial life changed in Mars' early history. Curiosity has been exploring on Mars since 2012. It reached the base of Mount Sharp last year after fruitfully investigating outcrops closer to its landing site and then trekking to the mountain. The main mission objective now is to examine successively higher layers of Mount Sharp. 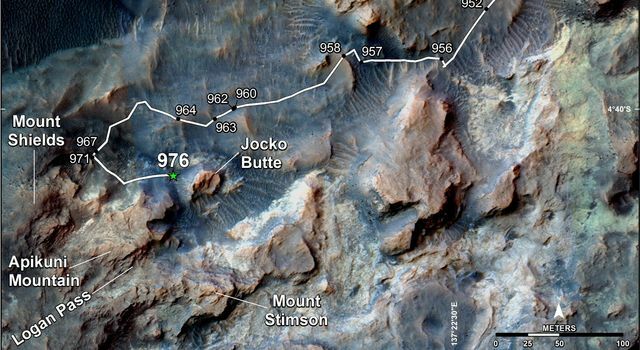 Curiosity spent several months examining the lowest levels of the mountain's basal geological unit, the Murray formation, at an outcrop called "Pahrump Hills." Then it set off toward a site called "Logan Pass," where the team anticipates a first chance to place the contact-science instruments at the end of the rover's arm onto a darker geological unit overlying or within the Murray formation. "In pictures we took on the way from Pahrump Hills toward Logan Pass, some of the geologists on the team noticed a feature that looked like what's called an 'incised valley fill,' which is where a valley has been cut into bedrock and then filled in with other sediment," said Curiosity Project Scientist Ashwin Vasavada of NASA's Jet Propulsion Laboratory, Pasadena, California. This unusual geometry of the rock layers was noted on the side of a rise called "Mount Shields," which sits northwest of the planned route to Logan Pass. 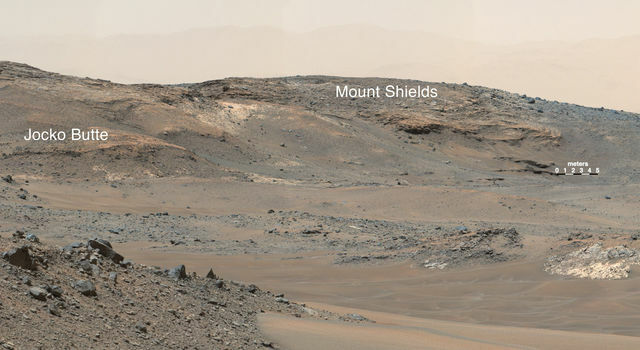 The team chose in late April to divert the rover to the base of Mount Shields. 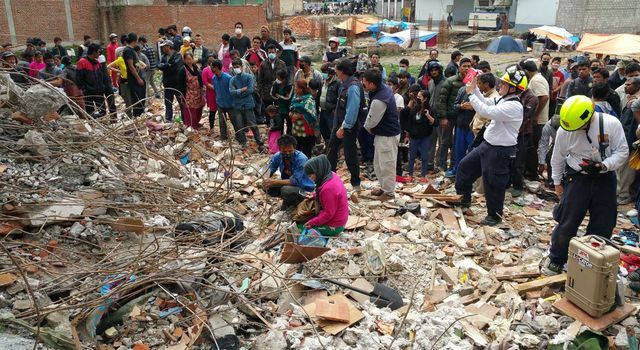 "We wanted to investigate what cut into the mudstone bedrock, and what process filled it back in," Vasavada said. "The fill material looks like sand. Was the sand transported by wind or by water? What were the relative times for when the mudstone formed, when the valley was cut into it, when the cut was filled in? 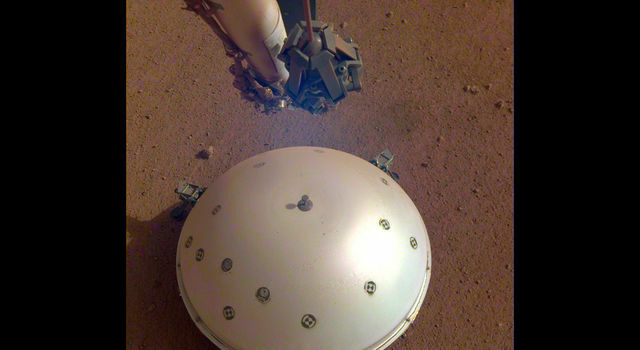 "It's exciting to see this on Mars for the first time," he continued. 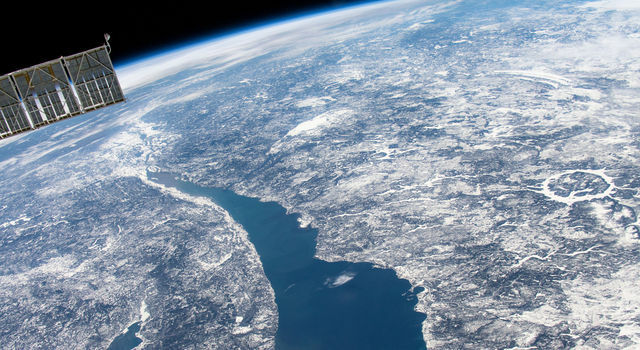 "Features like this on Earth capture evidence of change. What in the environment changed to go from depositing one kind of sediment, to eroding it away in a valley, to then depositing a different kind of sediment? 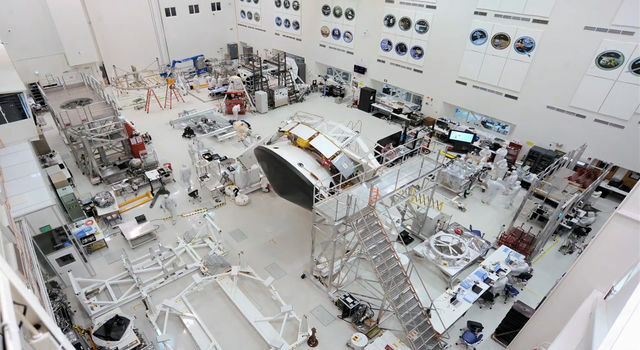 It's a fascinating puzzle that Mars has left for us." Scientists are examining the evidence collected at Mount Shields as the rover approaches its next study area, at Logan Pass.